I’m Janos Honkonen, a 40-something writer of speculative fiction. After a career spanning rainbow trouts, computational linguistics, TV production, a psychogeriatric ward, sniffing acetone and grading it on a scale, tech, science and adult entertainment journalism, wrangling Moon Nazis and diving as a marine biologist I finally landed in the games industry, where I currently write for video games. In addition to squeezing out words I make occasional noise with a theremin. I write both in Finnish and in English, so this page is an unfortunate mix of both. “Vespula”, 2013 – Finnish, Ruumiittomat, an anthology of ghost stories in Finnish. “Ajatustason ohjausvirhe”, “Tiedä mitä haluat”, “Dinosaurukset rääkyvät ulkona” – Finnish, Kummalinnun munia series. Drabbles. “Itse ilma syttyi tuleen”, 2015 – Finnish, Käärmeenliekit – an anthology of Finnish dragon stories. “Ne ovat niin helppoja saaliita”, 2017 – Finnish, Varjoisilta kujilta – an anthology of spefi cat stories. “Black Ice”, “The Dinosaurs Screech Outside” – 2017, English, The Self-Inflicted Relative – 33 Fantastic Stories in 100 Words – an anthology of drabbles. “Eläimet huutaa, ihmiset ei huuda”, 2017 – Finnish, Tämä jalka ei ole minun – Kauhuja omasta kehosta – an anthology of body horror stories. 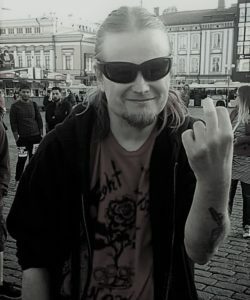 “Toiseksi tulleita ei lasketa”, 2017 – Finnish, Meliwas ja muita kaupunkeja – an anthology of urban fantasy. “The Air Itself Caught Fire”, 2017 – English, Never Stop – Finnish Science Fiction and Fantasy Stories – an anthology of speculative fiction for the Worldcon 75. “Kello ei ollut mitään, ei minään päivänä” – 2017, Finnish, Murtumia maisemassa – an anthology of urban exploration stories. “Sadan vuoden huuto”, 2017 – Finnish, a standalone story published in Portti 4/2017 magazine and the winner of the yearly Portti competition.